The aim for the Leaf Seat was to set out a footstool that was beautiful in its own right, using bold colours and drawing on nature and graphics patterns as inspiration. The resulting Leaf Seat also embodies, in a single, modular shape, her concept for flexibility in modern furniture. Not everyone nowadays lives in big houses so with this footstool I aimed to design a piece of furniture which works on its own or, when put with others, instantly turns into a larger object. The seats interlock in a variety of ways, to create seating arrangements to stimulate communication and interaction. 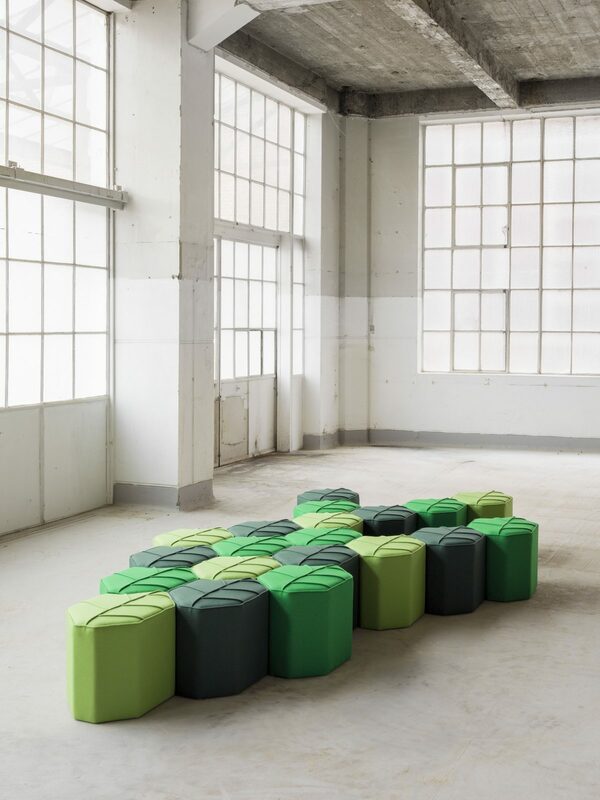 There are endless options to arrange this modular shape, imagine creating one big leaf or connecting them to make a daybed. Meanwhile, a host of Leaf Seats could be combined to create a forest effect reflecting the seasons and would work great in any interior- home, office or hotel..